it was a saturday morning when i went to hear mass at saint joseph cathedral in hanoi. the mass was scheduled at 5:30 and i was about some minutes early. i walked around the cathedral and took pictures of its façade. built in 1886, it is neo-gothic in style similar to indonesia’s gereja katedral jakarta which i was able to visit last march. 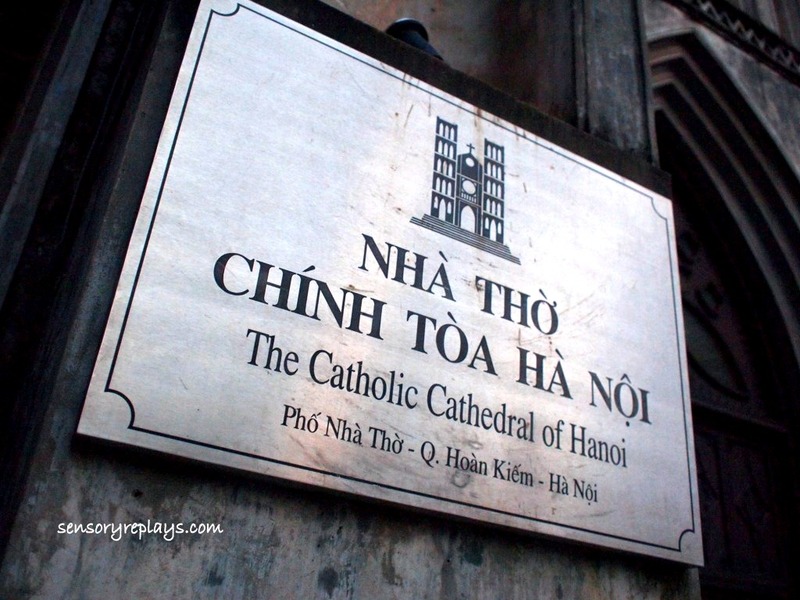 the cathedral was closed in 1975 upon reunification of vietnam and was not reopened until 1985.
i have read some reviews about it being inaccessible due to the locked high fence and closed doors, likely it is only open during mass. 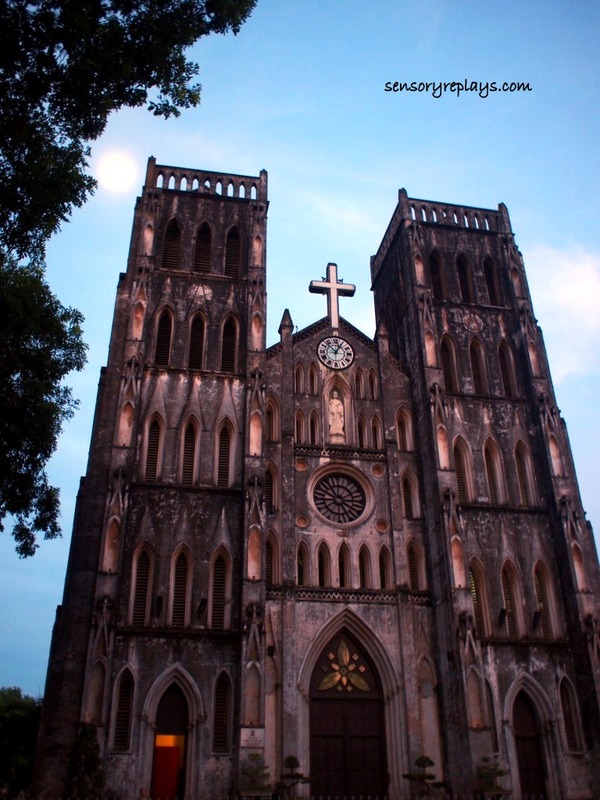 the cathedral is located in hoan kiem district. it creates an interesting fact that between the busy streets and the bustling of people and many motorbikes of the old quarter, a solemn, beautiful edifice exists. i was reluctant at first to take pictures of the altar when i was inside for it might be prohibited. a novena was ongoing so i simply just took a few shots. i then took a seat on the last pew near the main entrance door of the cathedral. the mass started and it was in vietnamese, though i did not understand a single word there was still the part of the mass when they sang the lord’s prayer with the church goers hands slightly lifted. when the mass has ended, most of the interior lights were shut off. 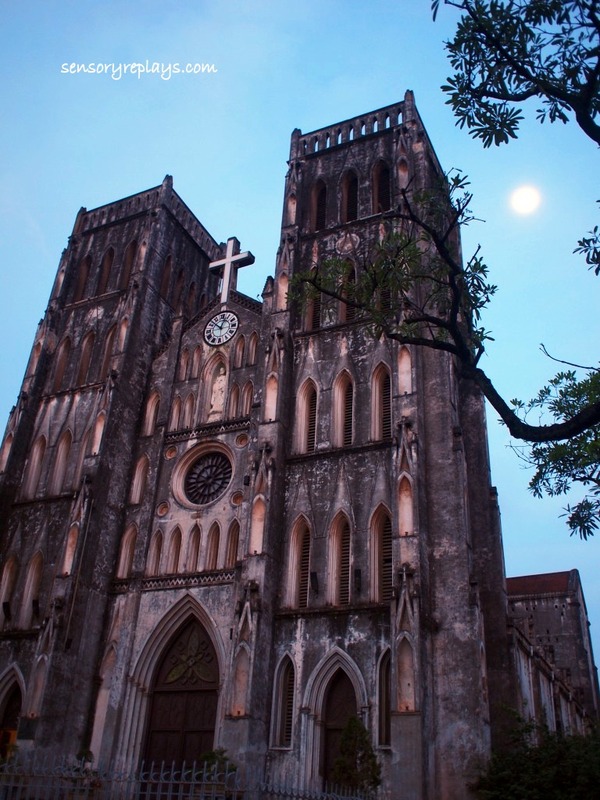 about 7% of vietnam’s total population are catholics. 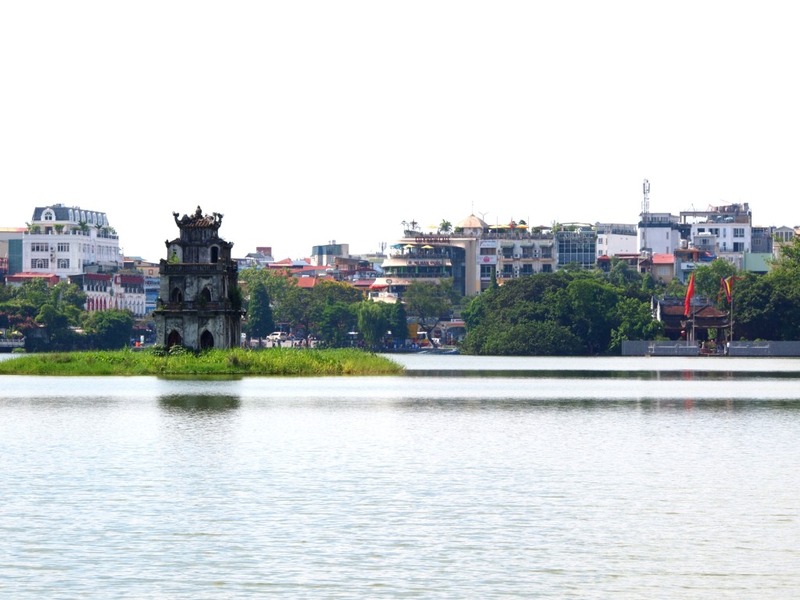 midday i walked around hoan kiem lake, which is near the old quarter of hanoi and a walking distance from the hotel i was staying on. 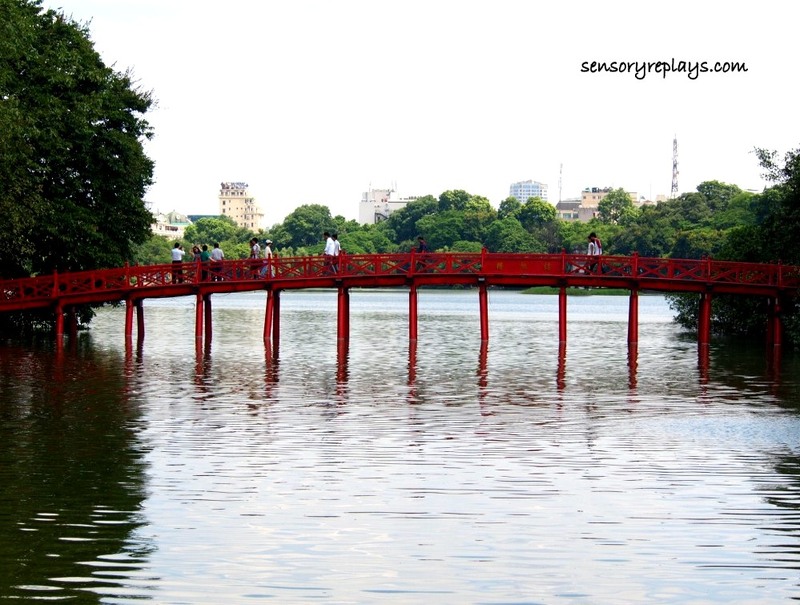 it is said to be one of the major scenic spots in the city and serves as a focal point for its public life. 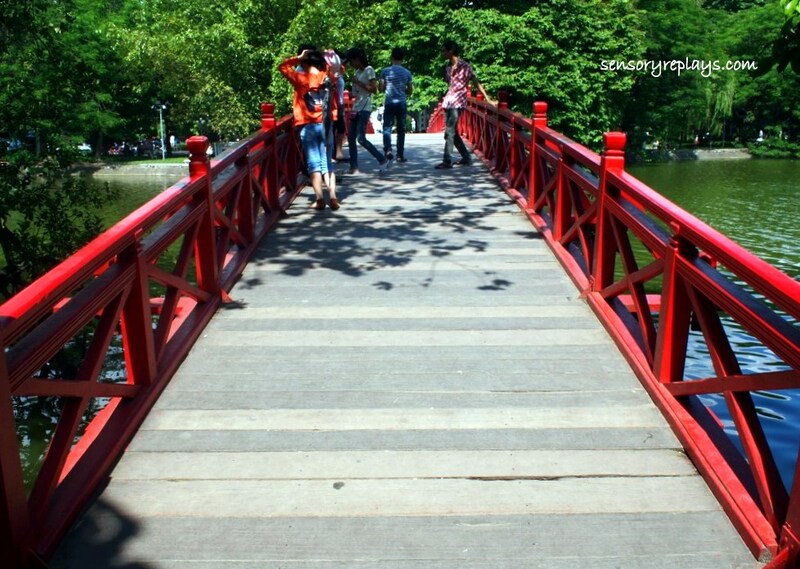 the welcoming morning sunlight bridge (cau da huc) is a red wooden bridge that connects a small islet in the lake to the shore. there is a small entry fee to get into the islet. inside is a temple and some souvenir shops. this structure is the main gate. 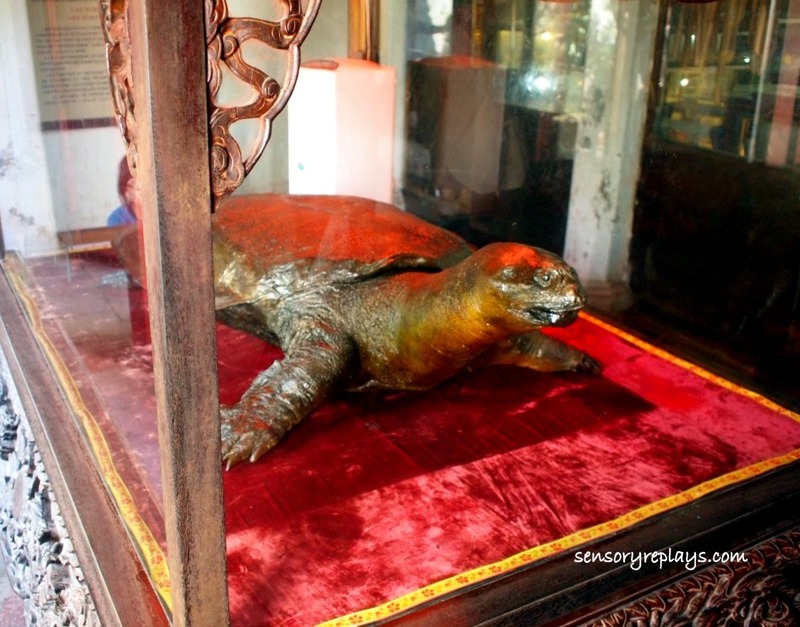 a preserved specimen of the hoan kiem turtle is on display in the temple. these endemic, soft-shelled turtle specie was known before to be extinct but was then found out that there is one elusive female that still thrives in the lake. 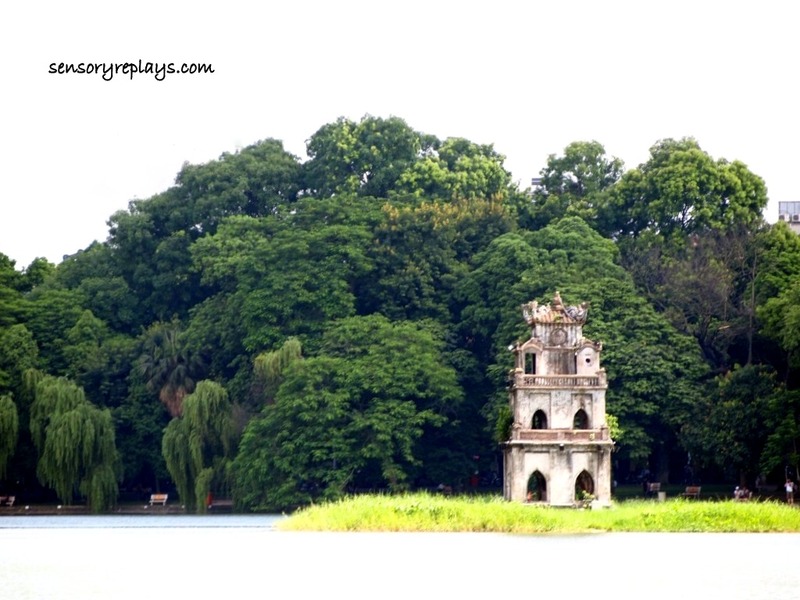 the turtle tower, a small pagoda erected at an islet in the middle of the lake. 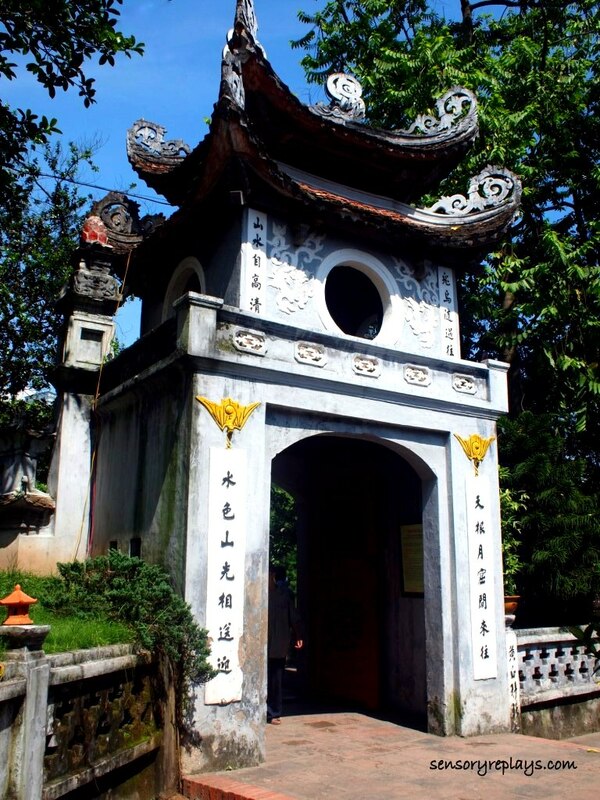 it is a tower honoring the mystic turtle of hoan kiem. 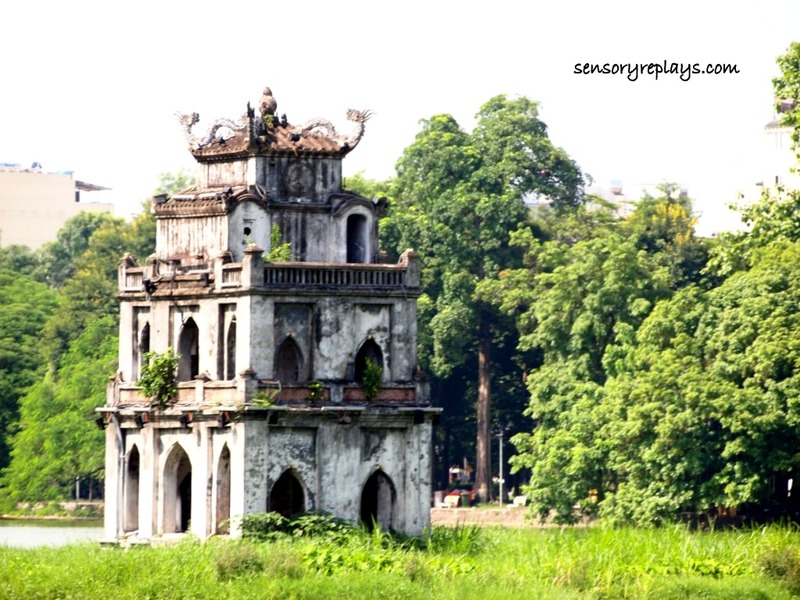 the turtle tower (thap rua, in vietnamese) was built in the mid-18th century. This entry was posted in been there and tagged gereja katedral jakarta, hanoi, hoan kiem, hoan kiem lake, hoan kiem turtle, lone travelling, morning sunlight bridge, old quarter, solo travel, st. joseph cathedral, turtle islet, turtle tower, vietnam, vietnam chronicles. Bookmark the permalink. 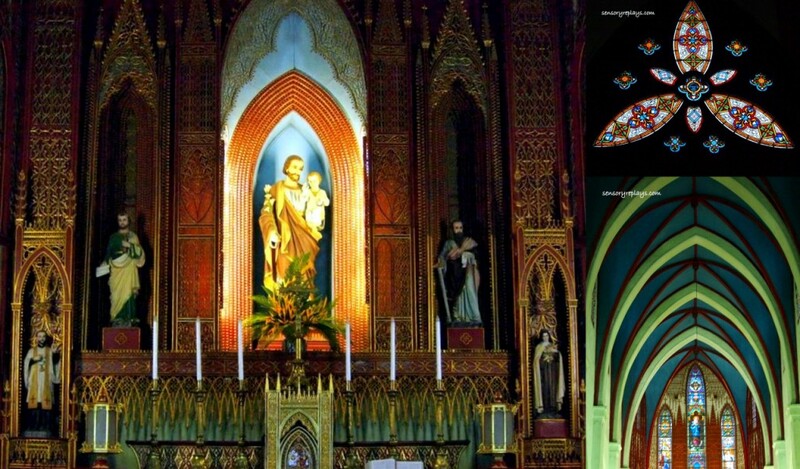 the shot on the interiors may be a little blurry but it’s a great thing you took the attempt kasi ang ganda ng altar. thank you for sharing. i also like the first photo of that red bridge; better sana kung may reflection sa water kaya lang that depends on time of the day of course. .. thanks, doc! nakaw shot yung sa altar, yun na yung pinakamaayos worth posting, hehe. .. thanks sol. glad that you read my posts. .. viva cebu! will visit the island on november with my ma, i hope it pushes through. matutuloy yan, out of the country nga natutuloy eh! btw, got you something special on my blog, rob, hope you like it! .. yeah lito, sana makapunta rin tayo ng spain. kaya lang mahirap visa dun, hehe. ang ganda nung church! it reminds me of san sebastian (i don’t know why) and notre dame! .. kasi grace siguro because of their gothic architecture. hi dorm boy. do consider visiting vietnam, sayang lang di ko napuntahan ang saigon at kulang na ang araw ko. 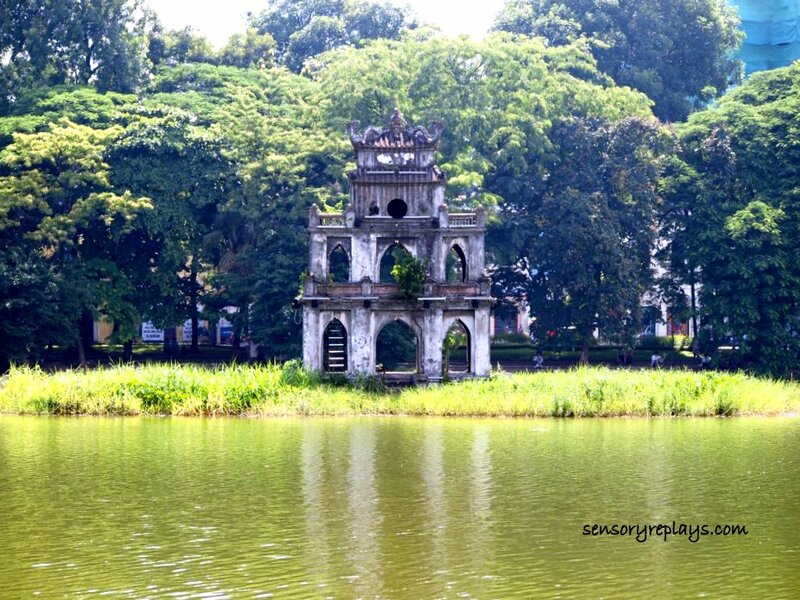 notre dame of hanoi, such great photos! looking forward to visiting vietnam at the end of the year. i’m currently stalking your vietnam entries for some trip ideas. .. have fun raine! make sure you visit halong bay – day tour is cheap, got mine for $25 all in!